At Half Time I was sipping a lager and looking intently at a large Rum & Black chaser in the warmth of the Durham Suite reflecting on how was it possible that the fourth placed team in Division 3 could be 0-3 down to a Vauxhall Conference side in the FA Cup. I have never ever walked out of a football ground, featuring my beloved team at half time in disillusionment but that warmth and those refreshments were very enticing at that precise moment. My £8.00 space on the East Terrace would be uncomfortable but thankfully I endured the discomfort. The FA Cup memories of the encounters with Chelsea the previous season were still very fresh in the minds of Bees fans and we wanted to taste that glory again. A home draw to start the new campaign was just fine. However Woking started the game at a super fast pace with Gary Phillips called upon early to make a fantastic stop to deny Scott Steele. Then after 12 minutes the Cardinals went one up through a Colin Fielder header. 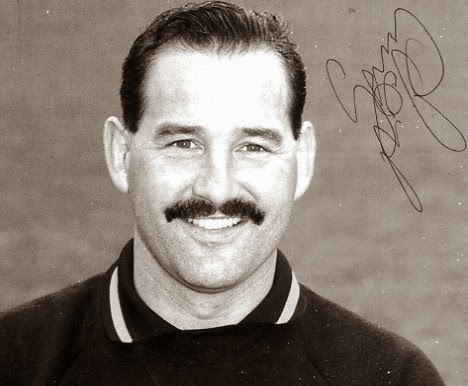 Ex Chelsea starlet Clive Walker soon began to run the show and his rasping drive three minutes later rebounded off the post and fell invitingly to Lenny Dennis for 2-0. After 34 minutes it was 3-0, Walker ingeniously skipped through the Bees defence and let fly to give Phillips no chance. Linvoy Primus once told me that Ray Clemence’s team talk at the interval broke the sound barrier and allegedly could be heard in the stand above the dressing rooms. Clemence replaced Mark Newson with Paul Wilson and it turned out to be an inspired substitution. 'Wils' proved that afternoon that he truly did have amber blood in his veins giving what was arguably his best performance in a Barnet shirt. Carl Hoddle, Lee Hodges and Dougie Freedman then began to come to life and Barnet replied with two goals in a five-minute spell. Wilson’s determined run and cross reached Gerard McMahon who stabbed home from close range. Freedman and Hodges magically created space for a cross which found Mark Cooper free on the near post, 2-3. 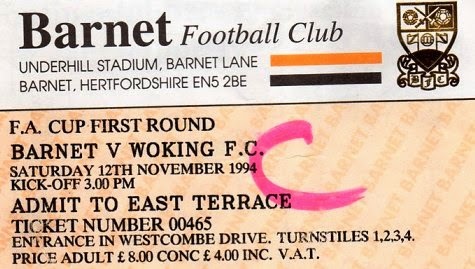 Woking then regained their two-goal advantage as a result of a bizarre incident. A poor Phillips drop kick fell to Steele. His powerful effort ricocheted off Hodges and onto the cross bar before bouncing and screwing back into the net like a snooker ball! Laurence Batty in the Woking goal made a string of fine saves as the Bees created chance after chance. Eventually on 75 minutes Hoddle’s pinpoint cross found Hodges to head in Barnet’s third. With ten minutes remaining justice was done as Cooper’s shot on the turn incredibly levelled the scores at 4-4 to earn the team a replay at Kingfield the following Tuesday evening. Barnet: Gary Phillips – David McDonald –Alan Walker – Carl Hoddle – Mark Newson (Paul Wilson 45) – Linvoy Primus – Gerard McMahon – Dougie Freedman – Lee Hodges (Micky Tomlinson 88) – Mark Cooper – Peter Scott. Sub not used Paul Newell.